For the past several years I have taken the effort to drink American wine for the Thanksgiving holiday. While I largely kept to that theme this year, I did kick things off with a bottle of Spanish Cava. I did so because the earliest Thanksgiving memories of my mother are from Spain. She spent her childhood in Zaragoza where the family was sure to celebrate Thanksgiving. They used imported American ingredients to prepare the classic dishes of turkey with gravy, potatoes, green beans, and of course, many, many pies. They did, however, drink Spanish wine with their meal. Our Spanish bottle of 2010 Recaredo, Intens, Rosat Brut Nature Gran Reserva took several hours to open up. While it does require a few more years in the cellar, it eventually revealed attractive hard cherry flavors with just the right amount of texture. Imported by Neal Rosenthal. This wine is a blend of 58% Pinot Noir and 42% Monastrell. Alcohol 12%. After a few hours of air, the firm but quickly dissipating bubble made way to dry flavors of hard cherry and cola. Quite different and certainly rather in need of age, things wrapped up with a textured finish and just a hint of yeast. **(*) 2018-2025. I tend to rely on red wine for Thanksgiving and this weekend I tasted through some mature reds. Lou and I picked up a number of bottles from the Earthquake Cellar which was recently sold off by BP Wine. The NV Sebastiani, Cabernet Sauvignon Bin 271, North Coast Counties bears no date but the fact that this magnum is in a 2/5 gallon bottle dates the wine to the 1970s at the latest. I personally believe the wine is from the 1960s for several reasons which places it during a period of fascinating change as detailed in History of Sebastiani Vineyards, 1955-Present. At the beginning of the 1960s, Sebastiani was a bulk wine operation that produced wine solely for other labels. Some 90% of this wine was dessert wine such as port, sherry, muscatel, and tokay. By the early 1970s the transition to selling table wine bottled under the Sebastiani name was completed. The bulk operation was no more. The impetus for change developed in the mid 1950s under the control of August Sebastiani. At the time, the Allied Grape Growers/Petri Group were going to start bottling their own wine at facilities throughout the country. Gallo, in response, decided to bottle their wine in lightweight bottles so they could ship it across the country. These two actions put direct competition on Sebastiani which had no choice but to change. There is also the story that August Sebastiani’s wife Sylvia tasted a “really, really, really good cream sherry” which turned out to be a wine produced by Sebastiani for another label. Why not bottle such good wine under their own name? The Sebastiani brand was developed in the 1950s and a very basic bottling machine known as a Fillabelmatic was purchased. However, the transition away from bulk wine production did not begin in earnest until around 1960. Throughout the 1960s dessert wines were still produced but various tiers of wines were developed including table and varietal wines. The varietal wines were not only bottled in 4/5 quart bottles but also in half gallon bottles and apparently magnum bottles. Our particular bottle of Sebastiani wine clearly predates the conversion to metric wine bottles. This requirement was passed in 1977 and went into effect in 1979. The basic Sebastiani Cabernet Sauvignon label from our bottle was used during the 1960s and 1970s. Bearing the common theme of “Sturdy and Deep-Flavored” this label was used for both non-vintage and vintages wines. Vintages wines such as 1963 Sebastiani, Cabernet Sauvignon Bin 9, 1968 Sebastiani, Cabernet Sauvignon, and 1970 Sebastiani, Cabernet Sauvignon, Proprietor’s Reserve all list “North Coast Counties” with a winery location of “Sonoma Valley, California”. The 1972 Mountain Burgundy, 1973 Barbera, and 1974 Cabernet Sauvignon, Proprietor’s Reserve that was bottled in 1979, all bear “Northern California” as well as the zip code 95476. This suggests that the non-vintage blend could be from the period of 1963 through 1971. 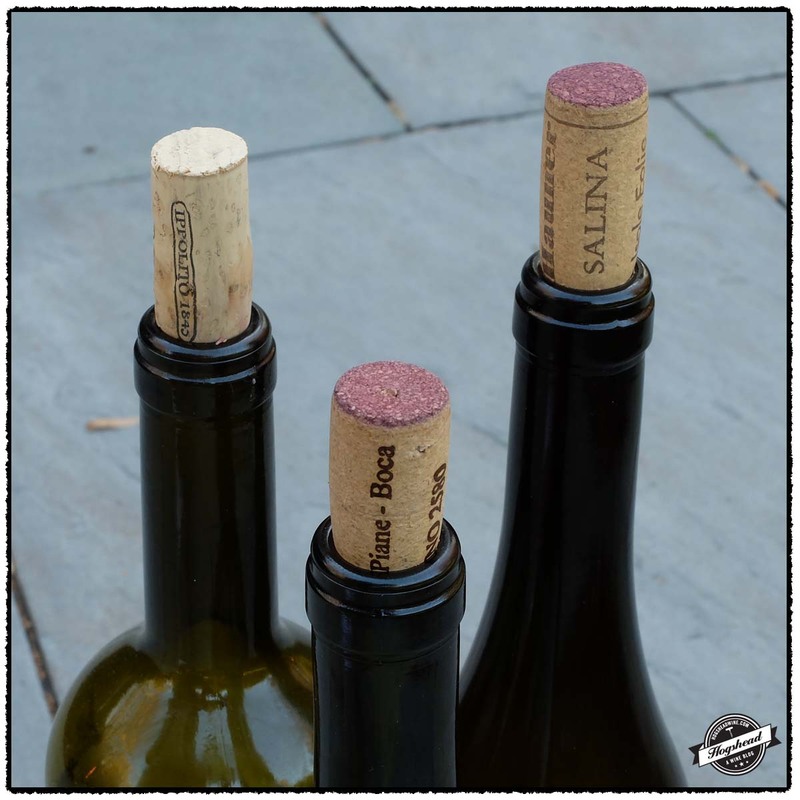 The cork was solid and the wine itself in sturdy enough shape that it drank fine over three evenings. It was rather stinky and animale at first but it did clean up. The fruit was sweet with rounded flavors and no hint of French or American oak. Instead this time-machine of a wine transported us back to the days of redwood. The images it conjured might have outpaced the quality of the wine but it was enough to last a glass or two. As for the other wines, the 1991 Knudsen Erath, Pinot Noir, Willamette Valley slowly responded to air over the course of an evening. With cherry and wood box flavors it only gave the slightest hint it would not develop any further. By contrast the 1996 Newton, Unfiltered Pinot Noir, Napa Valley was forward on the nose and in the mouth with plenty of fruit and glycerin. While clearly modern, it was not a bad drink at all, and in surprisingly strong shape. The 1999 Domaine de la Charbonniere, Chateauneuf du Pape was in great shape, offering everything you could want from a somewhat rustic Rhone wine which has not yet hit full maturity. Alcohol 12.5%. The nose was quite earthy at first with animal fur aromas. Over time the stink faded off to reveal sweet fruit and wood box flavors in the mouth. The wine softened a touch revealing rounded flavors and gentle old wood that lasted over the next few days. ** Now but will last for many years. Alcohol 13%. The nose revealed gentle aromas of earth, cherry, and tobacco. In the mouth the firm cherry flavors matched the polished wood notes. This slightly savory wine still sported a rather fine structure. The flavors thinned out some by the finish where there were some cola-like flavors, watering acidity, and roasted earth. *** Now but will last. Alcohol 14.5%. The wine was immediately aromatic with round fruit and wood box. In the mouth the flavors were forward with round black fruit that was almost thick with glycerin. With air this modern wine showed more minerals, blackness, and some nearly resolved tannins. ** Now – 2020. Imported by Ginday Imports. Alcohol 14%. This wine had a good core of red and black fruit and a pleasing amount of structure that leant towards the not quite rustic personality. Clearly a good wine in shape for continued development. *** Now -2022. There was also a pair of dessert wines. From the lightest of a group, the bottle of 1988 Chateau La Tour Blanche, Sauternes was youthful, fresh, and rather unevolved which meant it did not tire the palate at all. A brief taste of the 2007 Velich Apetlon, Seewinkel Beerenauslese, Burgenland already reveals an interesting amount of complexity. It is noticeably richer and thicker so think of it more as a sipping wine to wrap things up. Imported by Luke’s Distribution Co. Alcohol 14%. In fine condition, this wine brighter, floral and yellow fruit aromas. In the mouth the youthful, floral and orange citrus accented fruit has an appealing level of viscosity. The level of acidity keeps things fresh and slightly watering through the saline marked finish. I would cellar this further. *** Now – 2035. This wine is a blend of Chardonnay, Scheurebe, and Riesling that was fermented and aged in oak barrels. Alcohol 12.5%. Already a deep color , aromas of petrol with both fresh and dried apricots step out of the glass. With air hints of black tea develop. In the mouth, this is a thick wine with viscosity that is noticeable in the finish and aftertaste. ***(*) Now – 2035. Ruth Ellen Church was a food and wine journalist who published in the Chicago Tribune. Across 38 years, articles appear both under her name and the pen name Mary Meade. In the obituaries published in both the Chicago Tribune and The New York Times appears the statement “she became the first American to write a regular wine column” in 1962. The wine articles of Ruth Ellen Church are largely neglected. For example, she is not mentioned in the main text of Thomas Pinney’s “A History of Wine in America”, rather her name appears in an end note. I did not know of Ruth Ellen Church’s contributions to wine journalism until recently when I began researching Jane Nickerson of The New York Times. This exploration put me in contact with Professor Kimberly Wilmot Voss, University of Central Florida (Women’s Page History) who pointed out Ruth Ellen Church to me. Professor Voss will be presenting her paper “The First Lady of Wine Journalism: Ruth Ellen Church” next fall at the Food Studies Conference. A year ago I published the post “Certain opinionated turkeys disdain red wines on Thanksgiving Day”: A history of Thanksgiving wine recommendations from the 1930s through 1970s. In that post I focused on articles published in the Los Angeles Times, The New York Times, and The Washington Post. This year I look at the recommendations of Ruth Ellen Church in the Chicago Tribune. She began her wine column on February 16, 1962 during a period when The Washington Post and New York Times were largely silent about Thanksgiving wine recommendations. The Thanksgiving day wine recommendations published in both the Los Angeles Times and Chicago Tribune are broadly similar during the 1960s. The decade begins through asserting the classic recommendations of American sparkling wine to start and American white wine with the largely white meat turkey. Two distinct tracks soon form. In the Los Angeles Times, pairing rules are embraced including rosé and light red wine both for the dark meat of the turkey and stuffing. In the Chicago Tribune, white wine is paired with turkey and light red wine with game birds and ham. The inclusion of various game birds appears to highlight the different menu trends in Chicago compared with Los Angeles. When the classic pairing rules break in Los Angeles, it is to recommend Bordeaux whereas in Chicago the acceptance of dark meat in turkey brings forth the red wines of Beaujolais and the Loire. In both papers, the wine recommendations are general. American selections include both styles of wine mainly from California and New York, such as mountain white and sauterne. For higher quality selections, specific varieties are suggested like cabernet sauvignon and zinfandel. The eventual inclusion of European wines by Ruth Ellen Church focuses in on regions such as Moulin-a-Vent and Chateauneuf du Pape in France. Specific vintages are not recommended and the names of any producers are largely absent. I think this is a reflection of the time, the audience, and the style of Ruth Ellen Church. There are specific vintages and wines mentioned in her regular wine column but typically in the frame of a personal experience. She largely writes about wine regions and types of wine in an informative and appropriately detailed manner without making recommendations for specific bottles of wine. In the years prior to her regular column Let’s Learn About Wines, when she published under her pen name Mary Meade, Ruth Ellen Church often mentions wine as an ingredient when discussing Thanksgiving. For example, in 1957 she proposed “Beef Brisket In Red Wine” as an alternative dish to roasted turkey. In 1961, however, she recommends “Chablis, rosé, or a dry sauternes” with her “Roast Turkey with Walnut or Chestnut Stuffing”. She continues her wine suggestions with “port or sherry with dessert or after”. The following year in 1962, Ruth Ellen Church sets the holiday mood in her wine column by publishing under her own name the article “Festive Season Is Time For Serving Champagne.” As I have detailed before, more Champagne was sold to celebrate Thanksgiving, Christmas, and New Year’s Eve during the months of November and December than any other time of the year. This is a broad piece, rather than recommending specific wines, she details the production and serving of Champagne based on her experiences at Moet & Chandon in France, Almaden Vineyards in California, and Taylor Wine in New York. She found Champagne suitable throughout a holiday meal and even noted that one should not serve it after coffee for the tasting of the wine is killed. Three days after recommending Champagne, Ruth Ellen Church recommends “American wine” for the “American holiday” of Thanksgiving. She picks “not over-cold” bottles of white wine as ideal for both turkey and any seafood. Her suggestions are broad: dry semillon, mountain white, pinot chardonnay, pinot blanc, sauvignon blanc, emerald dry, folle blanche, chablis, sauterne, or Rhine all from California. For dessert she switches coasts in recommending a sweet wine such as white port, tokay, pink Catawba, or concord from New York. I find it great that she recommends “zinfandel, a truly American wine” for the guests that just drop in for wine and cheese. The color is admirable, “its fruity aroma is pleasing”, and most importantly it can stand up to cheese. This recommendation for transient guests predates Nathan Chroman’s suggestion of sweet wines for those who stop by for cookies, nuts, and fruit by nearly a decade. The wine suggestions for the following year of 1963 are consistent in sticking with an American dry white wine. Ruth Ellen Church does expand to include sylvaner, Johannisberg Riesling, and chenin blanc but does note they might be hard to find. Also of interest is that she recommends dry New York state sherry to start and New York rosé with turkey. She even expands to red wine for ham and game birds including Ohio burgundy and the varieties gamay and gamay Beaujolais. She does note only one specific wine, the Almaden blanc de blancs champagne. The Thanksgiving day wine recommendations largely thin out beginning in 1964. They do however push new boundaries in a short article published under the name Mary Meade that same year. In continuing the support for New York state champagne and white wines, she makes a historical tie to colonists by suggesting a very dry Spanish sherry at the beginning of the meal. The inclusion of red wine is expanded from game meat to turkey by concluding “[t]here’s no reason why we may not serve a red wine rather than a white one with turkey.” She suggests a cabernet sauvignon from California. During the Spring of 1967, Ruth Ellen Church traveled for several weeks throughout Europe. Her culinary adventures were chronicled in the series of articles titled “What’s Cooking in Europe.” She was not solely excited about food for she led off a series of articles about wine with “There Are Wine Jewels in Europe”. There is no doubt that her experiences eating and drinking wine provided her the background to fully break with her traditional Thanksgiving day wine recommendations later that year. In the Fall of 1967, Ruth Ellen Church acknowledged white wine with turkey was a “classical” Thanksgiving recommendation but the undeniable presence of the dark meat in a turkey and spicy stuffing mad light red wines “appropriate”. While the American white wine recommendations for white meat remain largely the same, the recommendations expand tremendously with French and other European selections. More specific than generic Beaujolais is the inclusion of Fleurie, Julienas, Morgon, and Moulin-a-Vent. In keeping with the lighter styles she recommends Saumur Champigny, Chinon, Tavel, and Anjou. Sweet wines like Anjou were previously banned from the “turkey table”. In recommending the later and sweet champagne, Ruth Ellen Church breaks another classic rule by admitting sweet wine “pleases a great many people.” The recommendations continue with Valdepenas and Rioja from Spain, Valpolicella from Italy, and rose from Portugal. Zinfandel is no longer relegated to drop-in guests. It is seen as appropriate for game birds along with sparkling burgundy, Chateauneuf du Pape and Cote Rotie from France, Chianti Classico and Barolo from Italy. “Ruth Ellen Church, Ex-tribune Editor”. By Jodi Wilgoren and Carol Haddix. Chicago Tribune. August 22, 1991. See also “Ruth Ellen Church, 81, Food Critic and Authot”. The New York Times. Published: August 23, 1991. We spent much of our spare time in November painting our living and dining rooms in anticipation of hosting our first Thanksgiving dinner at the house. It is impossible to not be excited about the holiday so while mature wine was generally required, I did not want to drink anything precious. The best of the bottles we tried is clearly the 1999 Gourt de Mautens, Cotes du Rhone Villages Rasteau. Some four years ago I guessed it would start drinking well this year and it is! This is always an expensive wine for the appellation, current vintages run over $60 per bottle in the States, but it repays with cellaring. Right now this savory wine shows dark fruit integrated with gorgeous structure. If the evolution of our bottle is any indicator this vintage will continue to develop with even more age. Also from Rasteau, the 2000 Domaine du Trapadis, Cotes du Rhone Villages Rasteau has aromas of roast earth which indicate to me that it is on the decline. Unfortunately, this bottle remained firm rather than open but was still pleasing enough to drink on its own. The final bottle of 1985 Quail Ridge, Cabernet Sauvignon, Napa Valley came from the Earthquake Cellar which explains the wine stained label. This small wine proved fully mature without evidence of decline. I appreciated the old wood and leather which come with age. Imported by MacArthur Liquors. Alcohol 12.5%. The nose was quite attractive, fully mature but not gone. There were similar flavors initially in the mouth before the overwhelmingly tart red fruit came out. Some pleasure could be derived but I imagine this must be drunk with food in the mouth. * Now. Imported by MacArthur Liquors. Alcohol 13%. The nose revealed clean, mature fruit which competed with roast earth aromas. In the mouth this wine was still firm with red and black fruit. The structure was still present in the minerally, roast flavored finish. With air the flavors took on some weight with cherry liquor notes before shedding intensity in the finish. Will last but will always be firm. ** Now – 2020+. Imported by Dionysos Imports. Alcohol 14%. This weighty wine builds power simultaneously with the developing ripe and grippy tannins. The menthol-like freshness persisted as does the watery acidity and bit of heat that breaks out in the end. The fruit is primarily dark but aspects of raspberry candy come out, all of which match the strength of the structure that coats the gums and teeth. With extended air, this savory wine takes on sweeter, blueberry fruit with both density and texture. ***(*) Now – 2025. Alcohol 13.3%. The roasted earth aromas hint at a wine beginning to decline. The mouth was better with some thickness to start. The flavors mixed with old wood box, old perfume, and a hint of eucalyptus and old leather in the finish. The tart cherry fruit matches the integrated acidity, very much present from the start. With air the wine fleshes out some. ** Now. Produced by various members of the Reynaud family, the wines of Chateau Rayas in Chateauneuf du Pape achieved legendary status amongst lovers of Rhone wines. Indeed, the 2005 Chateau Rayas which Roland opened for me last year, remains one of the best Rhone wines I have ever drunk. Perhaps more important than the sheer quality is the unique aromas and flavors of Rayas. With this singularity comes a steep price. Fortunately, the Reynaud family produces wine not only at Chateau Rayas but also Chateau des Tours and Chateau de Fonsalette. These later two estates produce wine from Vacqueyras, Cotes du Rhone, and Vaucluse. Over the years I have found they share an undeniable typicity at respectable prices. The wines of Chateau des Tours and Chateau de Fonsalette are scattered amongst the posts in this blog. When I first started tasting through the series of blind wines at Phil’s house, the Reynaud wines were the last thought on my mind. I would not have guessed I would sit down to an entire flight of them. Indeed, with the first two wines, 2010 Domaine des Tours, VdP Vaucluse and 2010 Chateau des Tours, Reserve, Cotes du Rhone, I thought were Trousseau from the Jura. However, as the wines opened up and I progressed through the tasting, my thoughts turned to des Tours in the Rhone. The one ringer stood out and I fully supported David in that it could only be from Domaine le Sang des Cailloux in Vacqueyras. This was a unique tasting for we tasted vintages back to 1998, which is when Emmanuel Reynaud took over winemaking at all three estates. The wines were opened but not decanted about two hours prior to tasting. The 2007 Chateau des Tours, Reserve, Vacqueyras was unfortunately a bad bottle. Every other wine changed throughout the evening. My favorite wine was the 2006 Chateau des Tours, Reserve, Vacqueyras. While I noted “incredible” in my notes a previous bottle moved me to write “the most beautiful Vacqueyras I have ever drunk.” This was a huge hit with everyone based on the empty bottle. I also really enjoyed the 2010 Domaine des Tours, VdP Vaucluse which reminded me in part of the 2006. Of a different nature, the structured 1998 Chateau des Tours, Reserve, Vacqueyras possessed great energy and Rhone-like ruggedness. At the end of the tasting, the leftovers were divided up. By all accounts, the wines continued to improve for the next two days. For this reason you should view my notes and ratings as just a brief glimpse of these wines. I highly recommend you try one of these fascinating wines. I suggest you start with the 2006 Vacqueyras for it is available at $60 which is one-tenth the cost of similarly aged Rayas. The medium opaque was not out of sync with the initial aromas reminiscent of Trousseau. There is a lovely start in the mouth with ripe strawberry flavors that persist through the aftertaste. With a fuzzy texture, the acidity continues to build, giving strong presence to the wine. The wine improves tremendously with air, revealing great beauty without blunt power. Clearly, there is a substantial amount of potential here. **** 2016-2030. Imported by MacArthur Liquors. With a lighter, garnet color than the first wine, this wine reveals a more mature personality. The fine perfume makes way to flavors of red fruit and ultimately a black fruited finish. There acidity is there throughout. Rather closed down. *** 2017-2027. Imported by MacArthur Liquors. This was a bit stinky at first and also revealed both volatile acidity and raspberry aromas. In the mouth the wine was frizzante in a manner reminiscent of some Barral wines. The wine improved with air the first night, showing a core of blue and red fruit and a coarse personality. By the end of the evening this brute of a wine showed plenty of fruit. The second evening the nose was clean with Kirsch and raspberry candy aromas followed by pure, driven fruit flavors. ***(*) Now – 2030. Imported by MacArthur Liquors. There was a similar smell to the 2009 vintage. The wine itself was a little cloud with flavors of old wood, Kirsch, some fruit and less aggression. Clearly an off bottle. Not Rated. Imported by Kermit Lynch. This young wine was clearly from the Southern Rhone, specifically Vacqueyras, and not by too far of a stretch Sang des Cailloux. There were leather accented flavors and upfront flavors of Christmas spices that leant for a comforting wine. The flavors were a bit tight with very fine and ripe tannins, minerals, and some extract. Nice stuff. It reportedly took an extra day to open up. ***(*) 2017-2027. Imported by MacArthur Liquors. The lighter, more mature color made way to a lighter and mature nose of delicate, berry fruit. Both the nose and flavors indicated that we had moved back in age. In the mouth were ripe, mouthfilling flavors there were lithe and complex. The sweet, red fruit built more and more in intensity until this full-bore wine clearly reminded me of Rayas. Incredible. **** Now -2030. The more aggressive, dense start made way to ripe blue fruit in the middle and a dusty finish. This was a more fruit-driven wine with the structure and acidity present. With air there is ample focused, berry fruit, good grip, and wood notes in the middle. ***(*) Now – 2020. The lightest color of the final three. A bit frizzante on the tongue tip but with beautiful concentration similar to a Chateauneuf du Pape. The energy makes the wine seductive but it is wound up with a supportive structure for future development. It apparently took two days for this to open up. **** Now – 2025. With most of my spare time currently dedicated to painting our living and dining rooms, my focus has shifted from historic research to wine drinking. This week we opened two bottles from the Vinkara Winery located in Turkey. Founded in 2003, this winery aims to increase international awareness for their indigenous grape varieties. The pair of wines we tried are both made from Kalecik Karasi. Both of the wines are quite light in color with the 2013 Vinkara Winery, Kalecik Karasi, Kalecik taking several hours to fully develop its flavor. Once open, the heady nose made way to an attractive mix of acidity, black fruit, minerals, and just enough ripeness. It is a wine certainly worth trying and my encouragement should be aided by the $13 price tag. Just be sure to double-decant it an hour or two before trying. I will do so for my next bottle. The 2011 Vinkara Winery, Kalecik Karasi, Reserve, Kalecik showed a similar fruit profile but the 14 month upbringing in oak clearly comes through on the nose and mouth. The wine remained a bit tight and the oak needs more time to integrate but I can see how some might prefer this bottling. I think that if you are at all curious about Kalecik Karasi then you should try entry version that was raised entirely in stainless steel. These wines are available at MacArthur Beverages. Imported by Winebow. This wine is 100% Kalecik Karasi that was aged for 12 months in stainless steel tanks. Alcohol 14%. The nose reveals dark red berries that are tart and a little heady in aroma. In the mouth the clean red fruit shows some roundness before quickly morphing into black and mineral flavors. There is a slight prickle on the tongue that makes way to fuzzy ripeness, a developing hint of cream, and a good aftertaste. *** Now – 2017. Imported by Winebow. This wine is 100% Kalecik Karasi that was fermented in stainless steel tanks then aged for 14 months in French-oak barrels. Alcohol 13.5%. The nose is headier with wood infused aromas. In the mouth the flavors are a touch muted, showing blue and black fruit with some vanilla wood sweetness. The wood becomes more noticeable as the wine progresses but the grippy and citric tannins at the end are attractive. It wraps up by leaving dry spices on the gums. ** Now – 2018. I was patient with the 2013 Yvon Metras, Beaujolais but in the end this wine drove me nuts. The nose is great and clearly evocative of an interesting Beaujolais but it is the flavors that distract me. In both the 2012 and 2013 vintages I picked up flavors of yeasty beer and popcorn. These flavors persist through the aftertaste which makes me forget what I enjoyed about the wine in the start. This wine is available at MacArthur Beverages. Imported by MacArthur Beverages. Alcohol 11%. The complex nose engages with bright floral, potpourri aromas which overlay red fruit. The flavors follow the nose with expected brightness quickly accompanied by a dry structure and minerals. Soon yeasty flavors of Pilsner beer and popcorn come out. The popcorn flavor lasts through the long aftertaste and quite frankly, distracts me. ** Now but will last. A trio of Italian wines made from Croatina, Gaglioppo, Nocera, Vespolina, and more! The three Italian wines featured in today’s post all posses good personality at less than $20 per bottle. 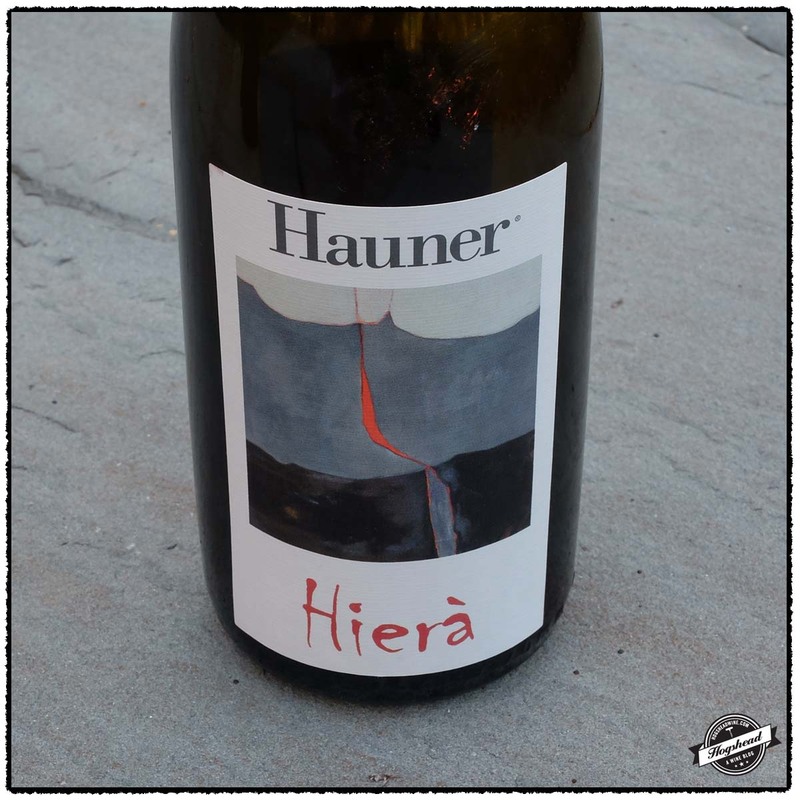 The current offering of the 2012 Hauner Carlo, Hiera, Sicily evokes the 2008 and 2009 vintages which I enjoyed very much. In fact, I enjoyed several bottles of this wine before I managed to write down a tasting note. It is a rich offering from Sicily with hard to describe flavors and very good tension. A must try! 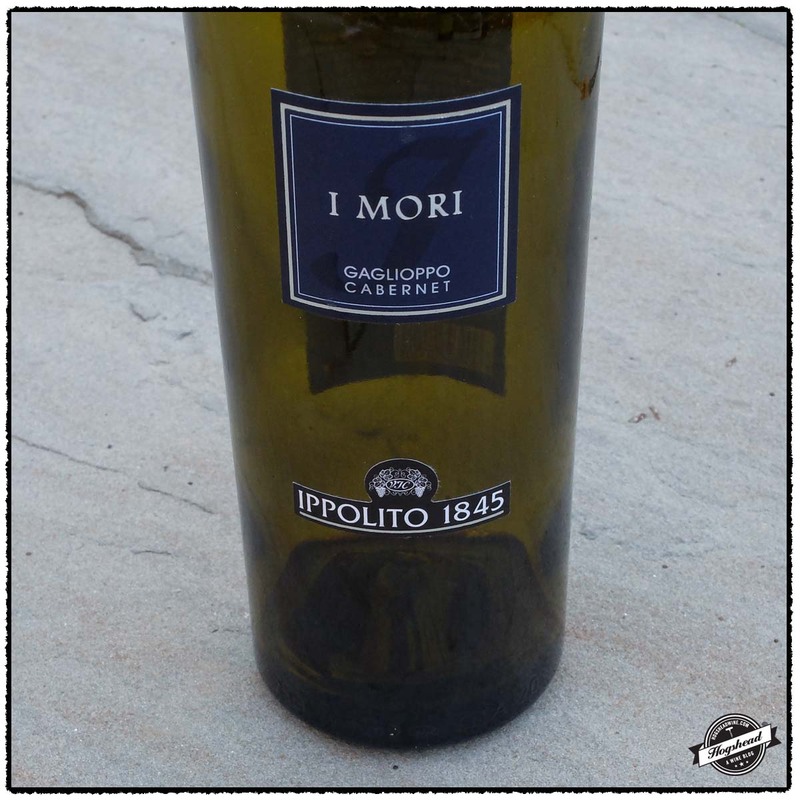 The 2012 Ippolito, I Mori, Calabria will certainly benefit from short-term aging to soften the strength of the Gaglioppo and to let the wine open up. Right now it offers a sense of its future so it is best left in the cellar. 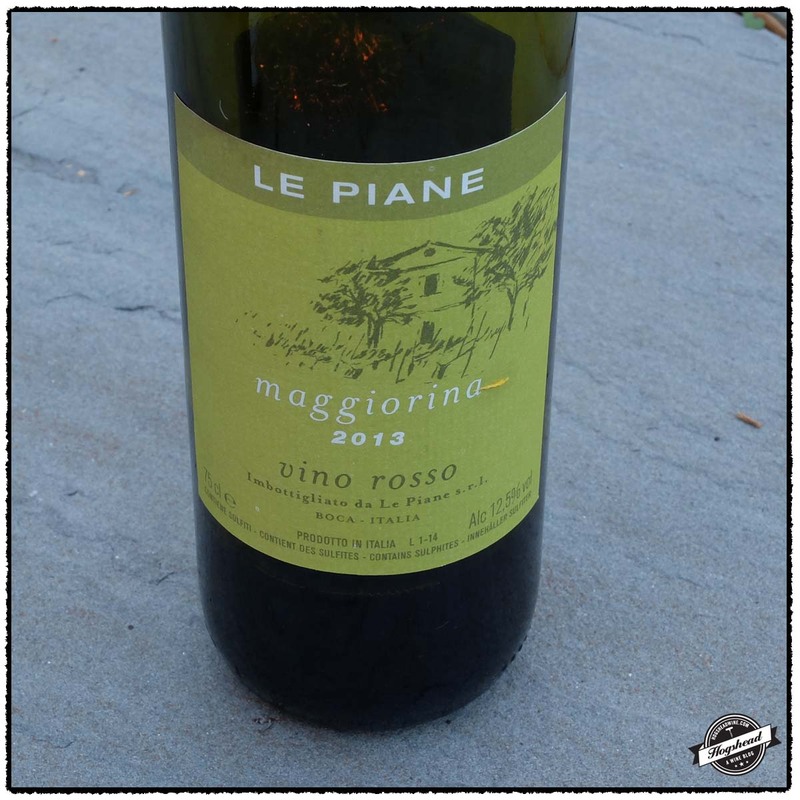 The 2013 La Piane, Maggiorina is the little brother of the excellent 2011 Le Paine, Piane, Colline Novaresi I previously tasted with Tim. The former contains a good proportion of Croatina as well as ten other varieties. It is a very light and not too tart wine, yet will remaining interesting to drink throughout the winter. These wines are available at MacArthur Beverages. Imported by Empson USA. This wine is a blend of 60% Alicante, 30% Nocera, and 10% Nero d’Avola. Alcohol 13%. The nose reveals exotic berries. In the mouth the tart and puckering red fruit, tingles the sides of the tongue. The clean flavors persist but fine and ripe tannins creep up during the aftertaste. I find the flavors hard to describe but there is good complexity, a darker middle, and rather attractive tension. *** Now – 2018. Imported by Cantiniere Imports. This wine is a blend of 70% Gaglioppo and 30% Cabernet Sauvignon. Alcohol 13.5%. The nose sported low-lying, rich aromas. In the mouth were tight flavors of red and blue fruit moved along by watering acidity. The flavors became dry by the finish matching the very fine, dry structure , and dry baking spices. With air this took on a bit of a grapey start and round hint but overall this needs a year to open up. **(*) 2016-2020. Imported by Free Run Wine Merchants. This wine is a blend of Croatina, Uvarara, Vespolina, Nebbiolo, and 9 other varieties sourced from vines 20-80 years of age. Alcohol 12.5%. The brighter aromas mix with greenhouse plants with a hint of earth. In the mouth the wine has very focused and gentle ripeness. It is not too tart with bright and firm, red fruit, watering acidity, and nice, fuzzy textured tannins. This lighter wine finishes with citric dryness. ** Now – 2016.